Greatest Hits is a series of chapbooks put out by Pudding House Press by invitation only. Over the years, they have published an enormous number of poets in this series. 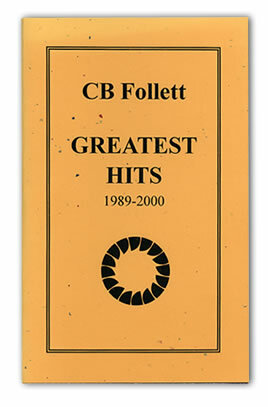 CB Follett's Greatest Hits is one of the earliest one. should not be on the inside sill looking out. the journey it must make to the heart. a movement out of its natural order. into a hole in the seam of time. to follow in on a sun mote and show the way out. Poem by CB Follett from "Greatest Hits."